Seven competing Margarita’s are Verde Margarita , Mexico City , Salted Plum Margarita inspired by Osaka Japan , LA Margarita inspired by Los Angeles , Passion Fruit Margarita inspired by Baltimore , Skyline Margarita inspired by Seattle , Mediterranean Margarita inspired by Barcelona , and North End Margarita inspired by Boston . 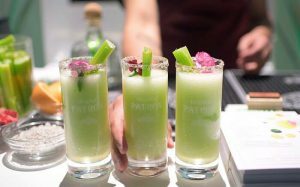 HOLLYWOOD (Spiritsman) 3/18/18–Patron hosted a fabulous Margarita Day Soiree on the official Margarita Day Thursday February 22, 2018. Celebrities VIPs and select media were invited to the elaborate private event in famous Hollywood studio in East Hollywood . Select media and Vips were invited to attend an early private tasting hour to meet with the international bartenders . Taste these 7 bartenders version of The best Margarita for 2018 representing their home city’s and country . The seven competing Margarita’s are Verde Margarita , Mexico City , Salted Plum Margarita inspired by Osaka Japan , LA Margarita inspired by Los Angeles , Passion Fruit Margarita inspired by Baltimore , Skyline Margarita inspired by Seattle , Mediterranean Margarita inspired by Barcelona , and North End Margarita inspired by Boston . Verde Margarita created by Jose Luis Leon . The Verde Margarita inspired by elderflower liqueur balances the vegetal notes of celery with light floral notes while fresh lime juice and Patron Silver offer classic margarita flare with a sugar-salt rim. 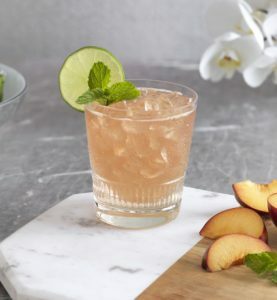 Takes classic margarita and turns it into a delicate feminine interpretation a plum preserved with salt popular in Japan. This Margarita incorporates everyday ingredients and mimics it’s sweet and savory flavor with a pinch of salt and bright Citrus notes of Patron Silver. Almost Famous flavors LA Margarita reflects a diverse culture and bartender Jorge Ortega’s eclectic backround by combining ingredients from around the world. He uses the lychee fruit as a sweet surprise that is balanced nicely with the spice of ginger syrup and Patron Reposado’s lightly Oak flavor. 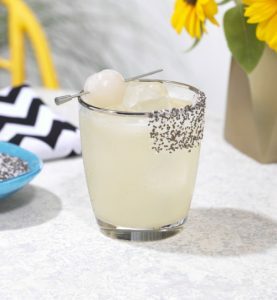 LA Margarita is completed with a chia seed rim adds texture to the cocktail and its story and Jorges Mexican roots. 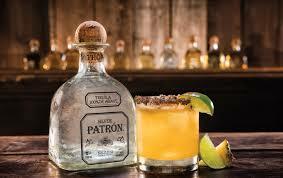 Passion fruit Margarita created by Aaron Joseph inspired by Baltimore Maryland big flavors . Bartender Aaron Joseph created this margarita from his Hawaiian roots and love of classic fruity Margarita flavors by combining a passion fruit syrup with a little bit of heat from the jalapeno. Patron Silver along with fresh lime juice as a hint of citrus to showcase true margarita endeared as Baltimore ‘s Finest and beyond . Skyline Margarita created by Megan Radke from Seattle Washington. This popular female bartender is inspired by Seattle’s locally-grown love of BlackBerry fruit . Bartender Megan Radke creates homemade Blackberry shrub that has balance with heat from a cayenne chili syrup and also honors the whole farm-to-table trend sweeping the Pacific Northwest. This Skyline Margarita is in fashion with a touch of citrus from fresh lime juice and Patron Silver makes this cocktail perfect rain or shine with Seattle’s own best grown flavors. 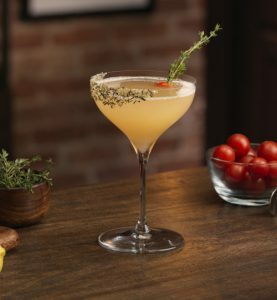 Mediterranean Margarita created by Yanaida Prado inspired by Spain and Spanish flavors . 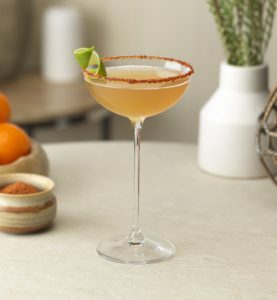 Citrus and Spice shines bright in this Mediterranean margarita which is made to reflect the vibrancy of Barcelona Amontillado Sherry combined with Spanish Origins complement the oaks of Patron Reposado and the orange marmalade puts a sweet and savory spin on classic margarita . The rim of glass is Chamoy/Tajin which adds heat to every sip , Barcelona style . North End Margarita inspired by Boston Massachusetts Stephen King bartender Boston born flavors Savory time and subtle sweetness of cherry tomato combined in a celebration of authentic Italian flavors of Boston’s famed North End Neighborhood bartender Stephen King incorporates lemon juice as a citrusy component in a one-of-a-kind margarita while Patron Reposado compliments the vegetable notes found in fresh tomatoes. Stephen King cocktail career began in a bar in London where he moved across the continent to New York and evolved with the creative bar culture and is now Bartender in Boston Massachusetts .